The Iconia Tab 10 is the latest tablet released by Acer. With a full HD screen and Dolby Sound system, the Tab 10 is made to provide the best of entertainment experience. The Iconia Tab 10 comes with a 10 inch screen. The full HD resolution on the large 10 inch screen looks clear and beautiful, and makes it easier to use than ever especially for those with large fingers. The screen is also bright enough to use outdoors comfortably. Its white sleek look is similar to Apple iPad. Thanks to an aluminum back cover it feels more solid than the latter when held in the hand. The weight is also very manageable at only 510 grams. Acer's latest tablet comes with a sweet quad core processor, great for multi-tasking and running the latest games from the Android store. The camera shoots pictures of up to 5 MP, but the image quality is unfortunately poor quality despite many customization options. The stereo speakers of the Iconia Tab 10 utilize a Dolby sound feature, so it's not surprising that the audio sounds great compared to other tablets. All-round entertainer. Being equipped with a Full HD screen and Dolby sound system, the 10-inch Android-based Acer Iconia Tab 10 A3-A20FHD is to ensure a breathtaking entertainment experience - according to the manufacturer. Our report reveals whether it is enough for this superlative. The Acer Iconia Tab 10 is a formidable budget- and kid-friendly tablet in a sea of not-so-worthy competitors. It has a lovely 1920 x 1200 display and a sturdy design. I'd recommend the Lenovo Yoga Tablet 2 to people who really value the multiple modes and who need extra power and performance. The nicest thing we can say about the Iconia Tab 10 is that it’s adequate. Unfortunately, that just about sums it up. It doesn’t excel in any areas. While it’s marketed as an entertainment device, its display isn’t sharp enough and the speakers are average and far too easy to cover up accidentally. Performance and battery life are also unremarkable, and the 16:10 aspect ratio isn’t ideal because of the screen’s size. The Acer Iconia Tab 10 is made from silky white plastic and sports a sharp 10 inch display that is designed to be used in a landscape orientation. The 10.1 inch screen has a resolution of 1280 x 800 pixels. This HD display features the Zero Air Gap technology that ensures increased vibrancy and image sharpness. The viewing angle is considerably wide at 170 degrees due to its IPS technology. There is a rather wide bezel around the screen. So, your thumb can rest there without interrupting the screen. The tablet is also reasonably thin at 8.9 mm thick and weighs only 540 grams, which makes it extremely light in order to be held in one hand. This tablet is powered by a quad core 1.3 GHz MediaTek MT8127 with a 1 GB RAM and 16 GB internal storage. This storage can be expanded up to 32 GB as there is a microSD slot available. The OS on this machine is an Android 4.4. There are a rear camera with a resolution of 5 MP and 2 MP front camera. The main attraction of the Acer Iconia Tab 10 is its relatively more affordable price and its 10 inch display, which is rare for mid-range tablets nowadays. There's little to get excited about with the Acer Iconia Tab 10 but that's fine with a very affordable price tag of £179. It's plain in appearance and quite heavy but apart from a few too many pre-loaded apps, the tablet offers good performance and decent storage plus a handy microHDMI port. Overall it's a good choice if you're looking to spend under £200 on a large Android tablet. The Iconia Tab 10 is a fairly unimaginative budget Android tablet that is noticeably light on innovation and features. The device has an unassuming design and offers slightly below average camera and processor performance compared with most other Android tablets. However, when you consider the £180 price tag this is to be expected. The Iconia Tab 10 offers a stable way to access the internet and mount basic productivity tasks, making it a solid, if dull, choice for buyers on a budget looking for a 10in tablet. Positive: Very good battery; cool under load; good price. Positive: Cheap. Negative: Disappointing sound quality; plastic case. With the android budget tablet market bursting at its seams it isn't surprising that Acer has decided to chip in with its own take with the Acer Iconia Tab 10 A3-A40-N68R. First and foremost is its screen resolution at 1920x1200 pixels for a 10-inch tablet with its price is unheard of, although there are some problems with that as it becomes apparent. While having a larger resolution is certainly good in anyone's books the processor and graphics that Acer decided to bake in certainly do not. Although general usage proves usability to be somewhat smooth when it comes to actually gaming on this tablet it starts to show sluggishness especially with its weak MediaTek MT8163 processor. Moreover, its integrated graphics is of the dual-core variant of the Mali-T720 which is usually much more suited for 800p tablets which goes to show the GPU is being stretched to its limits. 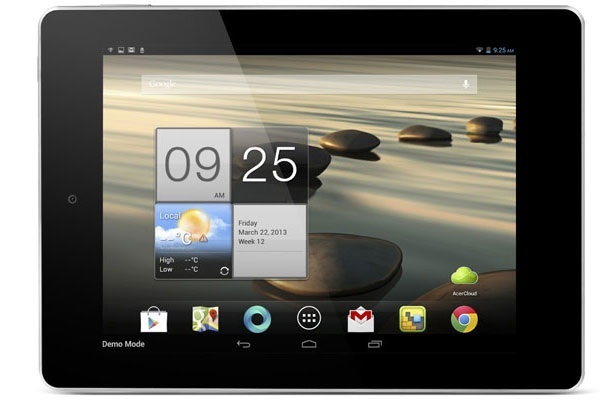 The Iconia Tab 10 A3 operates on Android 6.0 which has some Acer software customizations but generally operates quite similarly to stock Android. One of the main features of the Acer altered Android is it features an extra custom home screen on the left of the default, aptly named Left Page. It's generally a newsfeed page with your standard social media updates such as Facebook or Twitter. Although it is a welcomed feature it generally tends to be sluggish. Being a budget tablet it remains generally bloat free although some bloat does exist. The Acer Iconia Tab 10 A3 has 2 cameras with 1 on the rear and front, but both are neither impressive or worth a hoot about. The rear camera is a 5 MP sensor with no flash which is amusing because it feels like it was included for the sake of it. Image quality is somewhat average but better than nothing, however it should be noted that actual images might vary slightly from what is displayed. Additionally, users should note that the Acer Iconia Tab 10 A3 isn't a fast shooter with at least a half second delay in between shots. Finally, it's usually common to see budget tablets sip power which helps to boost battery life, such is not the case for the Acer Iconia Tab 10 A3 with its higher resolution display its battery does take a nosedive relatively fast with 5 hours while Wi-Fi and about 4 hours while gaming. In terms of audio quality, the Acer Iconia Tab 10 A3 has a 4-speaker array which somewhat gives a solid listening experience although tuning the EQ setting may help a little more. The only downside is the sound lacks the bass it needs to drive a much more pleasant listening experience. Overall because this is a budget orientated tablet one should not expect too much, but if you're just someone who wants a budget tablet with a somewhat better viewing experience the Acer Iconia Tab 10 A3-A40-N68R might not be that bad after all. The Acer Iconia Tab 10 A3-A40 is better than other Android tablets in the £110-130 range because it has a 1,920 x 1,200 pixel screen – it isn’t grossly pixellated, and therefore is a big upgrade. The Acer Iconia Tab 10 A3-A40 is better than other Android tablets in the £110-130 range because it has a 1,920 x 1,200 pixel screen – it isn't grossly pixellated, and therefore is a big upgrade. However, it doesn’t quite do enough elsewhere to be a complete success – or to avoid appearing a little dated in parts. Positive: Large screen; long battery life; slim size and lightweight; powerful hardware; good price. Negative: Poor cameras; unsupport mobile networking. Positive: Excellent display; good sound; long battery life; good price. Positive: Nice display; good speakers. Negative: Heavy. ARM Mali-450 MP4: OpenGL ES 2.0 GPU for ARM based SoCs with 4 fragment processors and 1 vertex processor.ARM Mali-T720 MP2: Integrated graphics card in ARM based SoCs. Can be configured with up to 8 cores (T720 MP8) and 650 MHz core clock (at 28nm). Supports OpenGL ES 3.1, OpenCL 1.1, DirectX 11 FL9_3, and Renderscript.Only some 3D games with very low demands are playable with these cards. MT8127: Quad-core ARM Cortex-A7 SoC clocked at 1.7 GHz that integrates a single channel 32 Bit DDR3-1333 memory controller and a Mali-450 MP4 GPU.MT8176: ARM based hexa-core SoC (2x Cortex-A72 clocked at 2.1 GHz, 2x Cortex-A53) for tabletsIntel Atom: The Intel Atom series is a 64-Bit (not every model supports 64bit) microprocessor for cheap and small notebooks (so called netbooks), MIDs, or UMPCs. The speciality of the new architecture is the "in order" execution (instead of the usual and faster "out of order" execution). Therefore, the transistor count of the Atom series is much lower and, thus, cheaper to produce. Furthermore, the power consumption is very low. The performance per Megahertz is therfore worse than the old Pentium 3M (1,2 GHz on par with a 1.6 GHz Atom). MT8163 V/A 1.5 GHz: Quad-Core ARM Cortex-A53 SoC clocked at up to 1.5 GHz (V/A version) with integrated Mali-T720 MP2 clocked at 600 MHz graphics card. 78.82%: This rating is not convincing. The laptop is evaluated below average, this is not really a recommendation for purchase.» Further information can be found in our Notebook Purchase Guide.